I've decided that after all these years of recommending books to my friends and family, and to you, my readers, that it's finally time to do a book club. I've always wanted to start one, but been hesitant for a number of reasons. What if nobody joins it? What if people don't like the books? What if people join it and then hate it? There are so many what if-s, and if I believed them all I'd never get anywhere. And so, I turned them around. What if it's a lot of fun? What if my friends really like it? What if I'm really good at it? What if - what if - what if I eliminate all the scary what if-s and have a blast? I'm starting a book club. 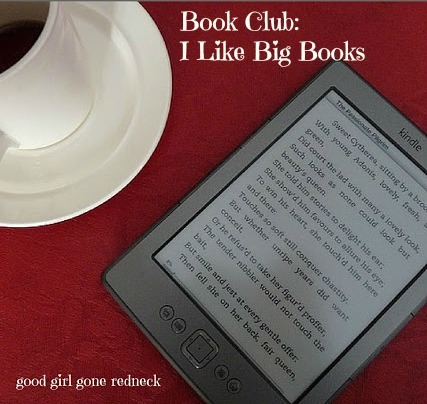 It will be held online, and will be a part of my blog and a Facebook group I've had for some time called I LIKE BIG BOOKS. So - are you interested? Would you like to join us? Click on over and request to join the FB group so you can find out more about this. And if you want to just talk books and don't want to be all 'book club-y' that's okay, too. I'll continue sharing reading recommendations, book reviews, lists and e-book deals I find, so you're welcome to join for that, as well. And if you can, leave me a comment so I know that you're requesting to join - so I don't think you're a spammer or anything. And start thinking of some of your favorite reads, or some books you've been interested in reading, because recommendations will be requested and happily accepted. Catch you soon, my fellow readers!! I put in a join request. Looking forward to your recommendations! Congratulations. You got over your fears and went ahead and did what makes you happy. I know you'll have a great time! A book club that I don't have to drive to, clean my house and make food, I am in! Oh, how I miss reading! I used to read several paperbacks a week. Now I cannot remember the last time I finished an entire book. Writing has become a full-time thing of me, so what little reading I have a chance to do is in the form of blogs. One of these days I need to disconnect from the internet for a few weeks and just READ the stack of books sitting in my office!! I'm in a book club now, but I read a lot more than 1 a month so I would love to try it out.